Bermudiana striata (Sm.) Moench, Suppl. Meth. : 113 (1802). Marica striata (Sm.) Ker Gawl., Bot. Mag. 19: t. 701 (1803). Paneguia striata (Sm.) Raf., Fl. Tellur. 4: 34 (1836). Sisyrinchium cuspidatum var. striatum (Sm.) L.E.Navas & Urra, Anales Fac. Química y Farmacia, Univ. Chile 20: 181 (1968), no basionym cited. Sisyrinchium spicatum Cav., Icon. 2: 2 (1793). Ferraria ochroleuca Salisb., Prodr. Stirp. Chap. Allerton: 42 (1796). Sisyrinchium reticulatum Dum.Cours., Bot. Cult. 1: 514 (1802). 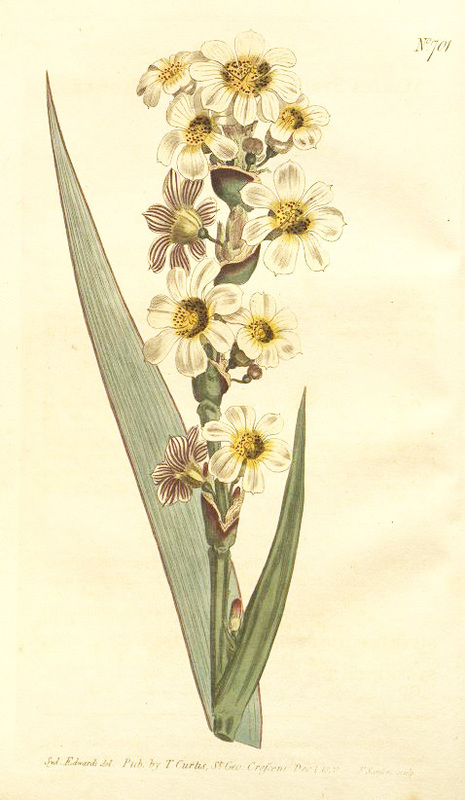 Sisyrinchium sertiflorum Salisb., Trans. Hort. Soc. London 1: 309 (1812). Sisyrinchium lutescens G.Lodd., Bot. Cab. 19: t. 1840 (1832), nom. nud. Sisyrinchium libertioides Steud., Nomencl. Bot., ed. 2, 2: 596 (1841), nom. nud.